10:30am - 4pm Sat. & Sun. Want to impress an out of towner or a date? Celebrating a special occasion? 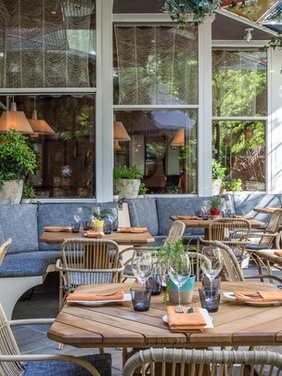 Take your guests to Narcissa at the Standard East Hotel. Now is a great time to take advantage of this unusually warm October weather, and sit in Narcissa's beautiful terrace out back. The space is really gorgeous and the attention to detail in the decor is impeccable. Narcissa has the perfect mix of breakfast and lunch items on the menu. Personally, I'd start with the French Toast bites for the table and then move onto the Crab Cake Benedict plus a side of Carrot Fries. Ordering a drink by name at Narcissa is almost as much fun as drinking it. Try the Gentleman Farmer with Vodka, Sugar Snaps and Tarragon, or for that extra kick, the Fly Me To Tulum with Tequila, Mezcal, Pomegranate and Chili. There are tamer, traditional cocktail available as well. Brunch reservations are accepted and recommended. 12pm - 11pm Everyday, Mon. - Sun. Hamilton's has been modeled after an old-fashioned 1940's soda shop, when times were simple and roller-skates ruled. 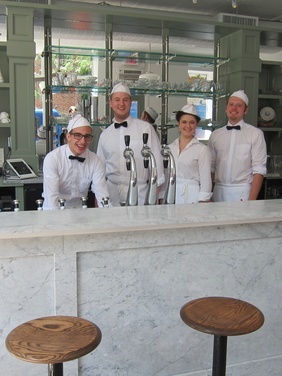 From the counter seating to the servers in white paper caps and bow ties, you'll feel transported into that era. Hamilton's is a casual and easy going eatery that is about one thing, keeping you comfortable and happy. BIG Note: With the exception of two $12 items, the menu is incredibly economical and nothing is over 10 bucks! Hamilton's has every classic soda shop item you can think of. Eggs all day? Yup. Coleslaw? Absolutely. Tuna Melts? You betchya ma'am. Saddle up at the bar and order an egg cream, chocolate shake or grape fizzy soda. But the real show stoppers are the malts served in old school, 1940's tall ice cream glasses. Brunch reservations are not accepted.